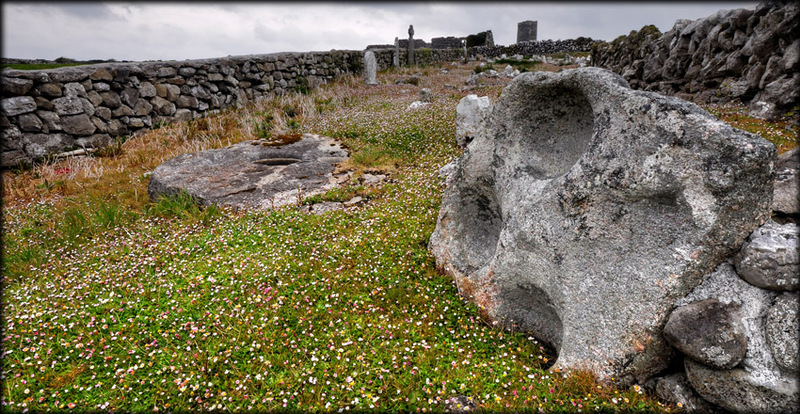 Located in the graveyard at the monastic site in Roscam are two wonderful bullaun stones. The largest stone is lying on end and has at least three humongous yet shallow bullauns, one of which is partly broken. There are traces of a fourth bullaun in the southern quarter. About two metres to the east of this stone is an earthfast boulder, in which there are another two large bullauns. These bullauns are smaller than those in the first stone but still very impressive. This delightful old graveyard is located south of the Church and Round Tower here at Roscam. 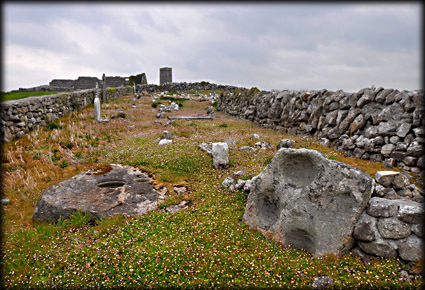 Situated: From the Round Tower head south to the graveyard. There is a gate at the southern end of the wallled graveyard. Discovery Map 46: M 3431 2415. Last visit April 2012.